In 'Journeys End', R.C Sherriff presents a realistic picture of life in the trenches and an effective portrayal of the horrors of war. How far do you agree with this statement? Include particular reference to setting, tone, characterisation and plot. 'Journeys End' by R.C Sherriff is about what life was like for a company of officers in the last few months of the First World War. The play covers six days and is set in a dugout on the front line. This essay explores the realism and the effective portrayal of the horrors of the First World War in 'Journeys End.' R.C Sherriff wrote the play ten years after the war ended in 1928. The gap in time, coupled with the chosen medium of the theatre could distort the true horrors of the war for the audience. 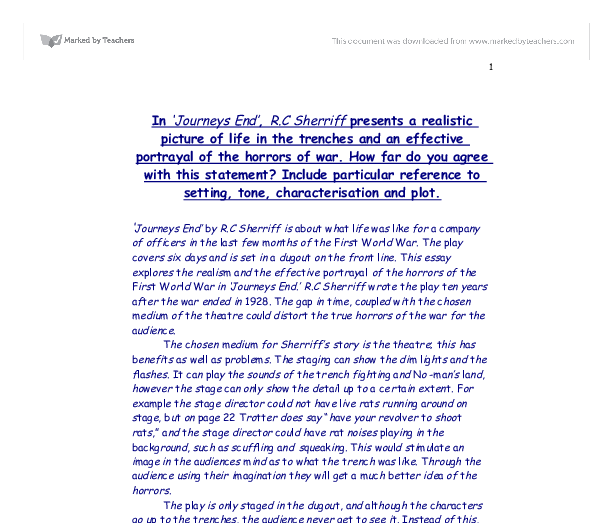 The chosen medium for Sherriff's story is the theatre; this has benefits as well as problems. The staging can show the dim lights and the flashes. It can play the sounds of the trench fighting and No-man's land, however the stage can only show the detail up to a certain extent. For example the stage director could not have live rats running around on stage, but on page 22 Trotter does say "have your revolver to shoot rats," and the stage director could have rat noises playing in the background, such as scuffling and squeaking. This would stimulate an image in the audiences mind as to what the trench was like. Through the audience using their imagination they will get a much better idea of the horrors. The play is only staged in the dugout, and although the characters go up to the trenches, the audience never get to see it. ...read more. A good example of this is on page 35: "walking round in me slippers after supper, smoking me pipe." In this example Trotter mentions common household objects (slippers and pipe), the effect of this is to universalise Trotter's home life. They often talk about how picturesque their home is, and what they would be doing with their loved ones if they were back at home, however they never speak once in the whole play about their homes in a negative way. This shows that they are remembering all of the good things about their family life, but their memories are purely happy, excluding any negative aspects. This portrays to the audience how much time the soldiers spend thinking of home, and how they feel cut-off from civilised human life whilst in the stinking, muddy trenches. The desired over all effect of the plot in 'Journeys End' is to show the depressing inevitably and intense waiting of trench life. The audience know that the big attack coming and it is most likely that most of the characters are going to die. However this inevitability is not a bad thing because it builds a sense of expectancy, therefore adding suspense - the audience will be waiting for the inevitable things to happen, just like the soldiers in World War I were. 'Journeys End' portrays to the audience how the soldiers would know that they could die any day, whether it was from a sniper, or in an attack. Everyday would be the same with the main emotional factor being boredom due to the intense waiting. The structure of 'Journeys End' is to have many conversations between the different characters, before and after each progression of the plot, such as an attack. ...read more. the soldiers felt that they were condemned to die, whether it was sooner or later, and the best way to die was with your friends and comrades in a common cause, even if they recognised that that cause had no real point. The play ends with the dugout collapsing on Raleigh and the audience being left in darkness. This is symbolic in the way that the public were 'left in the dark' after the First World War ended. The darkness is absolute with no glimmer of light, portraying how there is no hope for the future. The darkness that the audience are left in also has the effect of creating the feeling of despair. Unlike the other plays and shows such as 'Zip' (which Stanhope talks about on page 83) the lights are put out at the end, rather turned back on as is customary. Normally at the end of a performance the audience reflect upon the entertainment of what they just witnessed, the dark ending of 'Journeys End' makes it perfectly clear that the purpose of the play is not to entertain, but educate, and the ending is not happy but tragic. R.C Sherriff wrote 'Journeys End' as a way to portray to the public audience the horrors of World War I. Sherriff had many contemporaries such as Wilfred Owen and Robert Graves, most of these contemporaries used mediums such as poetry to convey their message of war life to the public. 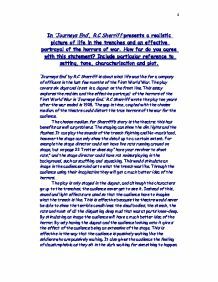 Poetry was better for describing the awful conditions, such as the mud, but I think that theatre is more effective when targeting the public such as Sherriff was, despite the way that the horrors can not be described fully. Thomas Ely ?? ?? ?? ?? 1 ...read more. Robert and Nav playing the parts of Bob and Nob, I think that we performed the scene very well. It turned out very good, quite a bit of it was really funny especially the chat up lines. Robert and Nav were very good at their parts the characters came to them very naturally! Other authors use a similar concept with different terminology and structure that are particularly important in presentations to persuade, such as sales presentations. Most authors agree that the number of main points should be limited to three to five. The preferred number of main points is three. This predilection for disguise has good and bad connotations; on one hand we never see the real Volpone and this impacts on our ability to trust him but it also shows his boundless energy, wit intelligence and imagination, all very attractive qualities for a "villain." Because of what has happened before, the audience is very aware of the danger lurking whereas Leila is not. This causes the audience to feel fear on behalf of another potential victim. Together with plentiful use of point of view and tracking shots, lighting and non-diagetic music at key points, Hitchcock is able bring out different emotions in the audience. Not only does this elongated farewell create humour, it also creates tension, as is shown when Pozzo states "I don't seem to be able...[long hesitation]...to depart." After Pozzo and Lucky finally depart the following conversation takes place; Vladimir: "That passed the time" Estragon: "It would have passed in any case"